Welcome to Saint Rocco's Association of Malden! The Saint Rocco Fraternal Society of Malden was founded in 1929 in the Edgeworth Section of Malden, MA. It was founded by a group of Italian-Catholic Immigrants to become a beneficiary society for those local people inflicted with the flu. In August of 1929, the society started its annual Feast of St. Rocco which became a three day event to raise money to provide death benefits to those members families who lost their loved ones during the year. The tradition continues today and is comprised of over 30 men and women dedicated to the work of St Rocco, patron of illness. Our funds are used to fund scholarships at four local schools in Malden. donated to local food pantries and non-profit organizations not having to be affiliated with any religious organization. This year we celebrate our 87th anniversary of the feast of St. Rocco. In 1973 St Peter's Church took over the failing society in order to keep the tradition alive. In 2001 St Rocco became its own 501 c 3 organization under its President Steven Ultrino The tradition lives on under the direction of the first woman President, Joyce Mover and TEAM St. Rocco. 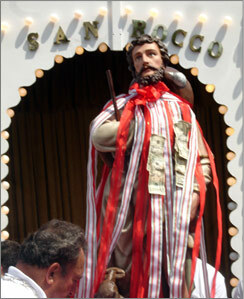 Viva San Rocco! 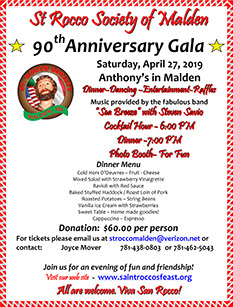 The Saint Rocco Fraternal Society of Malden is a group of men and women who in imitation of their Patron Saint, face the challenges of helping those in need to meet the basic necessities that insure a healthy and successful life in todays society. Our goal is to offer financial and moral support to those who struggle to address the educational, housing and nutritional needs of daily life and are often over-looked by society. We strive to follow the example of our Patron by assisting those who are faced with obstacles that limit their human dignity and ability to fulfill their potential as children of a loving God. In a special way we pledge to address issues that minimize the dignity of the person and the sanctity of the human body. Regardless of race, color or creed the Society pledges to stand with those who so often are the marginalized and disenfranchised in todays world. Funds raised by the St. Roccos Society will be used to assist needy students in meeting financial obligations to further their education and to assist individuals and families in securing adequate food, shelter and clothing. Response to these needs will be determined by the financial resources of the Society at the times of the request and is dependent on the generosity of our donors and on Gods ever-present blessings.